Welcome to Finnegan Marcus de Bree, the newest LibraryThing baby! Finnegan was born on April 11 (5lbs 10 oz, 20.5 inches) to Kristi de Bree and her husband Chris. You can see all past LibraryThing baby announcements here, going back 13 years to the birth of Tim’s son Liam! Welcome to Josephine Grey Krieger, the newest LibraryThing baby. Joey was born on December 29th, 2016—6lbs, 14oz—to our very own Kate Krieger, her husband Adam, and big brother Alex. Joey is already whiling away her days reading, and strangely enough, Kate has perhaps less time for books. Welcome to LibraryThing’s second baby of 2015, Alexander Stephen Krieger (Alex, or Sasha if you’re feeling fancy)! Alexander was born on March 9th—6lbs 5oz—to LibraryThing for Libraries’ Kate Krieger and her husband Adam. Baby Alex is honored to share his birthday with Tim’s son Liam! Welcome to Harriet Louise Topper Curtis! 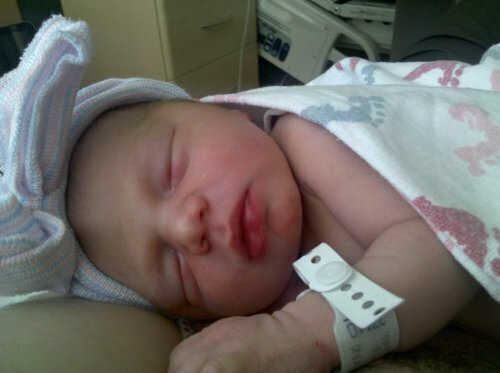 Harriet (or Hattie, as mom and dad like to call her) was born on January 6—8lbs., 6oz.—to LibraryThing Developer Mike Topper and his wife Eliza Curtis. 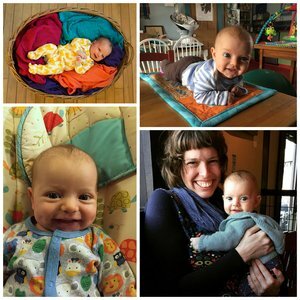 Hattie’s first few months have been exciting! She enjoys mornings, bouncing on a yoga ball, watching people eat with their mouth open, and not letting other people get any work done. Julian was born to LibraryThing library developer Chris Catalfo (CCatalfo) and his wife Joanna. Older sister Ellie is adjusting well. Julian caps LibraryThing’s odds-defying “Season of Babies“—five babies in five months! There is clearly something in the water here. Welcome to Octavia, the newest LibraryThing baby! Congratulations to Sonya and her husband Jason on the birth of their daughter last night at a healthy 8 pounds and 20.5 inches long. All three are happy and well. Not to be outdone by Mike and Lulu last month, Sonya live-blogged during labor. (Having had a baby myself once upon a time, I just have to say WOW/WHAT?! in amazement that she had the mental wherewithal to blog). Post your congrats on this Talk thread. Want more cuteness? See all the LibraryThing baby announcements here (and we’ve still got one more baby coming soon)! UPDATE (7/30/10): The original post was lost and we were unable to save the original comments. Our apologies, but please feel free to post new comments. Many congrats go to LibraryThing developer Mike and his wife Rebecca, on the birth of their daughter, the already impressive Lulu! Mike liveblogged the event, so you can check out even more cute photos. If you’d like to send happy thoughts, well wishes or scones, there’s a thread here. Lulu is the third LibraryThing baby born in the past month (Max and William joined the LibraryThing team at the end of March), and we still have two to go (myself, and Chris Catalfo) before July. If you’d like to see all of the LibraryThing newborns, check out the rest of the LibraryThingBaby birth announcements. Congratulations to John, LibraryThing’s systems administrator, and his wife Lou on their new twins, Max and William! That both were boys is a surprise—the doctors had believed only one was a boy. (William was going to be Willow.) Together with Baz (5) and Ollie (3), John and Lou now have a four-boy family, and more opportunities for John to perfect his Spiderman cake! There’s a best-wishes thread going here. John’s twins are the first of four LibraryThing births coming up in the months ahead—Mike, Sonya and Chris Catalfo are next! They will join three, now five, other LibraryThing babies. There is clearly something in the water. A joyous welcome to Jasper Daniel Blachly-Nelson, born to LibraryThing’s Librarian Abby (ablachly) and her wife Sara, yesterday at 8:56 PM—9 pounds 3 ounces, 21.5 inches long, 166 books! Update: More photos on Flickr! Update 2: Lisa and I visited Sara, Abby and Jasper at the hospital today. Everyone is doing great, and Jasper—cuter even than his picture—is clearly going to grow like a weed. Welcome to Katherine Evelyn Holland, born May 7 (6 pounds 11 ounces, 18.5 inches*), to LibraryThing developer Chris (ConceptDawg) and his wife Ashley. Mother and daughter are doing great. Chris has a “permanent smile” on. *That’s 3033 grams, 46.9 centimeters. Who says we don’t do metric?